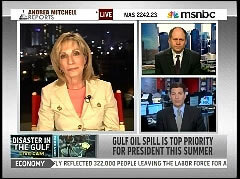 ANDREA MITCHELL: Mark Halperin, you've covered Barack Obama for so long and the entire campaign as you reported and documented in Game Change. Are you surprised that the White House has not been more adept at this? Because some of this is scheduling. You know presidents shouldn't have to be forced to demand, "Well, let me stay on the ground for more than two hours, let me meet with some real people." That really shouldn't be his call. MARK HALPERIN, GAME CHANGE AUTHOR: Well I don't thin k that's the only mistake in terms of symbolism and stagecraft that they've made in this crisis. I think three things are true. I think they get a really bum rap from the press about how much they've done on this crisis and, and for how long, I think they've gotten a lot of the substance, most of the substance right. Second, I think they have made a series of mistakes, not just not meeting as Jonathan correctly said, with real people who have been affected by this when they were down there, but as Jon Stewart and David Broder have both pointed out, he's done too much of the ceremonial aspects of the job, meeting with sports teams, hanging out with Paul McCartney. That, I think has been a big problem. But the third thing is, he will have a problem with the chattering class, no matter how much he bites his lip today, no matter how much he feels people's pain, until the hole is plugged. And they know that in the White House. This is a problem of substance. He's exacerbated his problem with the chattering class because of he's created this story line that he's Jimmy Carter. MITCHELL: And, and jump in here, Jonathan. Sure. JONATHAN ALTER: I was just gonna say Andrea I think that those are, Katrina comparisons, the Jimmy Carter comparisons, are too easy, but where they are relevant is that Jimmy Carter, when they seized the hostages in Iran in 1979, for 444 days, he let them also seize control of his presidency and apparently, the, the Democrats have some focus groups that show that the American public right now does not want to see Obama focus full time on this crisis. They want him to multitask, but he has to give them the impression that he is showing leadership, not just telling them that he's been a leader, and he has been too much the professor-in-chief and that's not the same thing as being the communicator-in-chief. I think Mark is quite right that for several weeks now, they have just missed the stagecraft of this event and they don't have a lot of time to make this right and to get back on his game.